Wilkes Morse learns Spanish from his kindergarten teacher Yessenia Infante, Wednesday, Dec. 5, at Dillon Valley Elementary School. Gov. Jared Polis' proposal to fully fund full-day kindergarten may free up $800,000 a year for Summit School District to use elsewhere. Gov. Jared Polis gave details on his proposed $227 million to Colorado lawmakers Wednesday morning to pay for full-day kindergarten in school districts across the state. Polis said the proposal was attainable and a necessity for cash-strapped districts that could better use the funds for teacher pay, among other things. 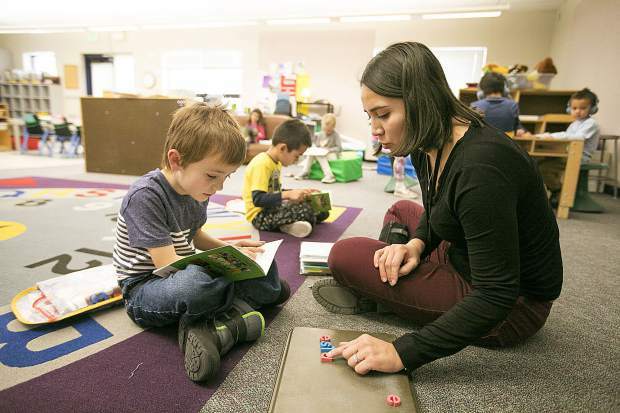 Colorado currently subsidizes half-day kindergarten in districts across the state, with full-day kindergarten only available when paid through local funds or privately. During his presentation to the state legislature’s Joint Education Committee, Polis said that as much as $100 million could be freed up in school districts statewide to pay for critical items such as teachers and infrastructure. Summit County has full-day kindergarten 58 percent paid for through the state subsidy, with a 2007 Summit School District mill levy paying for the other 42 percent. School superintendent Kerry Buhler said that comes out to about $800,000 a year to pay the balance on full-day kindergarten. With kindergarten taken care of, the county’s attention turned to early childhood care and education with the passage of Ballot Measure 1A this past November. Jennifer McAtamney, program administrator for Breckenridge-based Early Childhood Options, said that 1A is already providing tuition assistance for Summit parents who have 4-year-olds entering pre-K in the fall. The 1A program will be funded at a rate of $2.5 million per year for a decade. At the moment it is saving eligible families $50 to $100 a month from the normally exorbitant $325 or more they pay for early childhood education. However, the proposal for the state to go ahead and pay the entire portion of full-day kindergarten as soon as July is an intriguing one for Summit County, as the school district has the county constantly going back to voters asking for money when program funding or mill levies expire. With kindergarten paid for, there could be other ways to use the $800,000 raised annually from the 2007 mill levy. However, Buhler said, that’s only if the voters approve those changes. McAtamney said that while the kindergarten funding wouldn’t necessarily help with pre-K education, it would have a cascading effect that could wind up helping with pre-K and other needs for the school district, something she readily approves of.